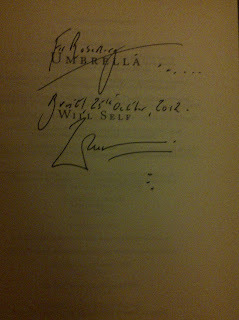 Last Thursday the writer Will Self came to the Arnolfini, Bristol to promote his new novel, Umbrella. Shortlisted for the Booker Prize which Hilary Mantel won with Bring Up The Bodies, Self's novel has mainly been discussed as a work of modernism. Indeed, last week's edition of Start the Week on Radio 4 posited that whilst a modernist work may now be nominated for the Booker, something more conventional like historical fiction would always win it. This comparison annoyed me and, moreover, struck me as erroneous. Modernist writing is a form or way of writing with strong connections to a particular historical period (making Self's 2012 offering more unique). It is not de facto simultaneously the narrative or genre or subject of a book. Virginia Woolf's The Lighthouse, Faulkner's The Sound and The Fury or Eliot's The Wasteland are not at all about the same thing just because they are written in various modernist styles. Therefore to say 'Mantel's book is about Cromwell and Self's is a modernist novel' is making a weak comparison. As it is, Self does deal with many aspects and concerns of modernism and the modern period in his text, perhaps explaining why he self-consciously chose to also write in the style. He also discusses hospitals, London, families, odd diseases, ageing and many other things. Self's book is modernist in two ways. Firstly it is written in a modernist style and secondly it explores the modernist period by making the main protagonist, Audrey Death, representative of the mechanisation of the 20th century in Britain. Too little of this has so far been discussed in criticism of the book. Instead, as with all discussions about modernism, a trite comparison is made between the new text and Joyce's Ulysses - frequently succeeding in scaring potential readers away by implied ideas of it being impenetrable - and then little more. 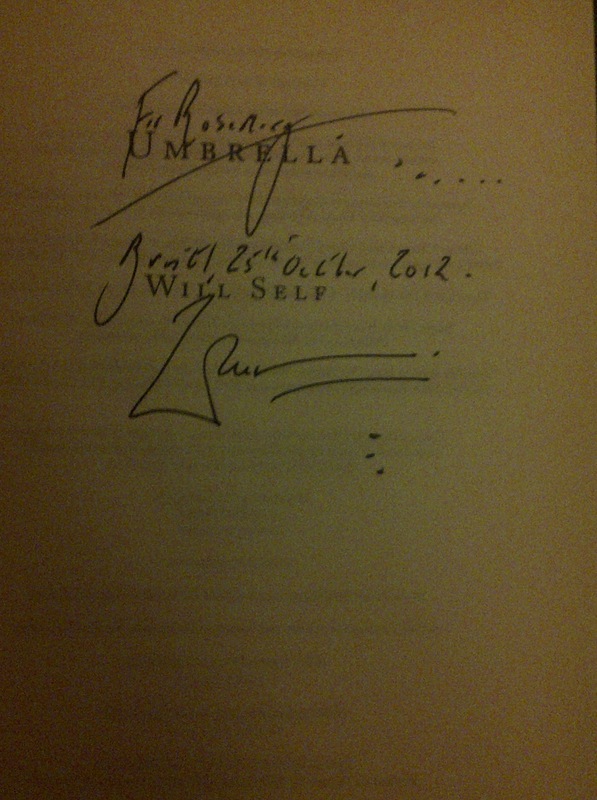 When Self read a section from Umbrella, he did so in multiple voices. Once I had got over how exciting it must have been to have him as a father who could 'do the voices' at bedtime, I also realised how much it added to the text. Roughly, each piece of italicised text is said in a different accent - frequently cockney. 'Momentarily sandwiched between two sandwich men' with the sandwiched said in a cockney accent reads very differently to the entire sentence read all in RP. A member of the audience had earlier made reference to Thomas's Under Milk Wood, and it is a good comparison to make. Once Umbrella is read as a montage of all these different voices and sounds it is the very opposite of impenetrable, it bubbles up and out and around your ears. Umbrella has a lot to say about modernism, the majority of which can only be accessed by those who bother to walk within the text rather than make one blanket comment about its surface structure.